is one of the only companies producing rawhide treats in the USA with USA beef hide. Of course that means were are creating American jobs and paying American taxes. But it also means that we are supplying dog owners with treats that have qualities that are simply not available in import products. 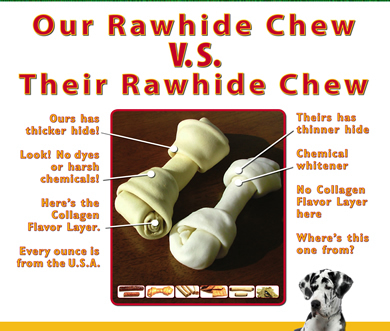 USA rawhide is fresher…and simply better for dogs. Our beef hides are only a few days old when they arrive at our Chicago plant in refrigerated trucks. Then they are kept under refrigeration until they are washed and sanitized, cut, tied and dried in our special ovens. The hides used to make Wholesome Hide treats are not split to increase volume as most import hides are. They are not treated with harsh chemicals that stabilize and whiten the hide. In fact, the hides we use are so fresh they still contain the collagen layer which we keep intact during processing. That gives our treats added flavor that is not available in any import product. Fresher hides and natural processing produces a rawhide treat that tastes much better to dogs! It’s safer for the dog, too. Compare Wholesome Hide with import chews. The hides that are used to make import treats sometimes take six weeks to reach a processing plant. And when that plant is located in a hot tropical country and the hides arrive unrefrigerated, you can imagine what they look and smell like. That’s why most hides in foreign counties need to be heavily bleached and treated with a variety of chemicals, including titanium dioxide (a paint ingredient) to make them white and stiff enough to turn into dog treats. They also split the hides at least once so they can produce more, but thinner, products. Even during the rolling and tying process, some overseas companies add scraps and other fillers deep inside the product to save money and increase weight. Of course all the processing invariably leaves behind some residue which spoils any natural taste that may be left in the hide. And the thin, “crispy’ nature of the treat makes it easier for dogs to break off shards of rawhide which can injury the pet.